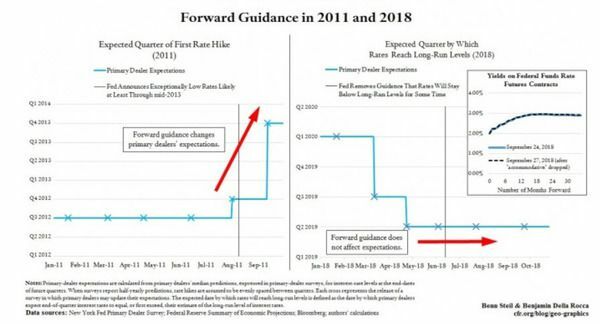 In the Wall Street Journal earlier this month, we examined the change over time in the market reaction to Fed “forward guidance” on future interest rates. During the crisis, with the Fed’s policy rate at zero, the markets reacted strongly to it. 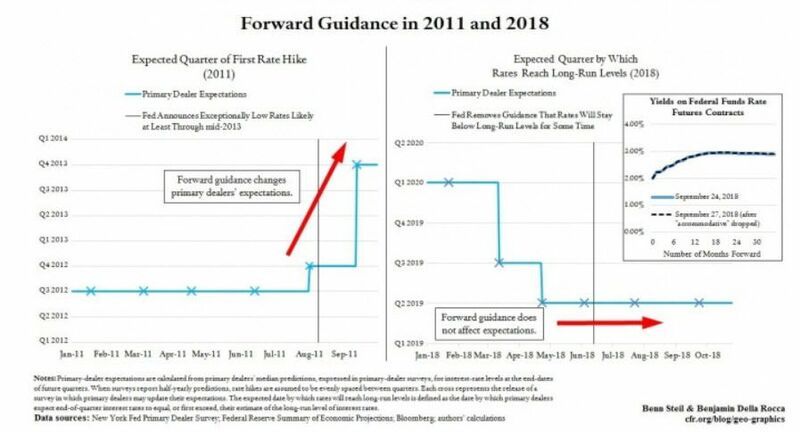 When back in 2011 the Fed pledged not to raise rates at least through mid-2013, primary dealers of Treasury bonds immediately pushed back their expectations for rate hikes—as shown in the left-hand figure above. Today, however, with the Fed’s policy rate well above zero, at 2-2.25 percent, only the press seems to care about the Fed’s message changes. We would like to see the Fed go further, however. That’s a mighty bad reason to raise rates, and a mighty good one to stop predicting them.